Just to give you some ideas regarding the EF Ford Falcon that you have recently bought... If you go to www.fordforums.com.au you will find two 300+kW Falcons with no bottom-end work. One of them has 380kW (running 22 psi on C16 with a hot camshaft) and runs 11.2 at 123 mph. The other has 350rwkW and runs a 10.17 at 132 mph (it has a mild port job, a hot camshaft and a GT35/40). If you have the time, the thread on the first car can be found at www.fordforums.com.au. I don’t think you will end up doing anything that wild, but at least you will know what they are capable of. I'm looking to set up something like this with either the aforementioned probe or with my multimeter and K-type thermocouple. What I want to know is if a metal probe is mounted in a brass compression gland, will the probe be reading the temperatures of the manifold itself? The gland seemed to be threaded into the manifold, which will get warm with under-bonnet residual heat from other engine components. 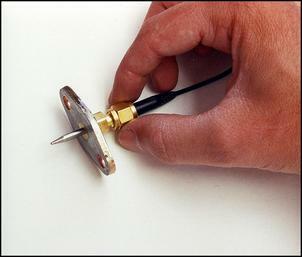 Is there any sure way of mounting something like this so that the metal probe is not touching anything but the incoming air? The compression gland shouldn’t have any effect on measured temperature because the temperature sensing element is in the tip of the probe. It’s important that the tip projects sufficiently out of the compression gland. I saw the request for detail on a good replacement gearbox for a 200SX from Daniel Rose in "Story Suggestion" – Response. It is true that these wonderful and highly fancied gearboxes are tragically very fragile. What is commonplace is to source an R33 GTS25t gearbox and fit that. You can find further detail on www.skylinesaustralia.com using the search feature. The R33 ‘box is strong, in reasonably good supply and is a common upgrade in high powered R32s and VL Commodores running the hybrid RB30 block with an RB25 or RB26 head. Best of luck with the new gearbox. In the article Multi Throttles it is stated that the E30 BMW 2.3-litre four at 147kW is the most powerful atmo engine to come out of Bavaria. I would like to remind the editor of the 3.0-litre four cylinders found in the Porsche 944S2 and Porsche 968 with 155kW and 176kW, respectively. I do not however dispute that it may be the highest specific output production engine of its class from Germany. If the fuel pump is upgraded, the fuel pressure regulator may also need changing if it is not able to return enough fuel to the tank to keep pressure regulated at idle. The rail pressure will rise and thus the vehicle will run rich at idle and in low injector duty cycle portions of the rev range. This is not realistically possible to tune around because the rail pressure is dictated by the voltage on the fuel pump (which dictates how much it flows up to the rail). If the battery voltage changes (ie headlights on/off, stereo on, electric fans on), then so does the rail pressure. I've spoken with a tuner who had this exact problem. No doubt you have already thought about it, but for a long time I've meant to write and ask if you have plans to start using video clips on AutoSpeed? Seems an obvious step and an easy way to provide something that the print mags simply can't. I know there would be a fair bit of extra work involved and it may be hard to get to a suitable standard but I think for some stories, the odd small video clip would be invaluable in explaining some things. Would be great to see some of the cars you drive in action too! I’m looking forward to your reviews of the new Commodores/Statesman/HSVs too. It’ll be interesting to see if they really are the leap ahead that other media are talking about. What strikes me as odd though, is that apparently most things I have read put the VE and BA/F neck and neck... And they carry on how much better the VE is than VZ... So what was going on beforehand? The BA should have been slaughtering VZ in reviews!!! Another good example of the kind of journalism Julian has often talked about being out there. We're considering adding video snippets to certain types of articles. We have some VE Commodores booked for review. Re Last of the LS400s... What ever happened to 'Mr SB' and the 735i replacement I wonder? 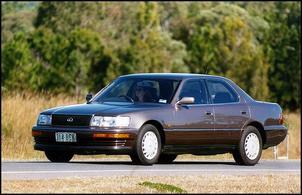 Julian replies: Mr SB, the first model LS400 we owned, was sold and replaced by a 1985 BMW 735i. The 735i was replaced by an NHW10 Prius. Now, as you can see, we've sold the 1998 LS400 and replaced it with a Honda Insight. So, from two V8 powered LS400s to a four cylinder hybrid and a three cylinder hybrid! In your articles about non-linear (variable ratio) steering systems – such as The New Breed of Controls - Part 1 - you neglect to mention the effect four wheel steering has over the effective steering ratio (ie steering angle versus turning arc). By steering the rear wheels in the same direction as the front wheels, my 4WS Honda Prelude (equipped with a purely mechanical 4WS system) is relaxing to drive at high speed, due to a low effective steering ratio. But turning the steering wheel progressively further appears to have the same effect as quickening the steering ratio, as the rear wheels transition from same-phase to opposite-phase steering. Later models control the rear wheels electronically and I believe there is potential for these systems to be modified to give varying ratios at different steering wheel angles and speeds. Perhaps you could explore this issue in a future article? Good point but, unfortunately, we don’t have a 4WS car to experiment with. I have just built and fitted the Jaycar kit for the electronic boost control and I tell you what, it works perfect! What I’d like to know is instead of making adjustments to the controller or any of the kits for that matter through the digital hand controller, is it possible to plug the cable into a laptop instead and have a program that simulates the hand controller functions (ie replace the hand controller with a PC). If you were smart enough at programming you could even view the map it creates on the PC.